Our boat, Molly J, is a highly modified Cal 2-46 in which we have invested over $600,000 (documented) during the past 12 years. I purchased her 15 years ago from the original owner, a former Navy Captain, who had her customized to his spec's with the intent of circumnavigating, but unfortunately developed Parkinson's disease and was not able to live out his dream. The designer of the original Cal 46 and subsequent Cal 2-46 and 3-46's was William Lapworth, designer of the Cal 40 and renowned for slippery hull (fast) custom one-off race boats and also production racer/cruisers during the 60's, 70's and 80's. She is the only liveaboard cruiser that Lapworth ever designed, and was the boat that “he most enjoyed designing” during his career (quote taken from an interview with Lapworth from a sailing rag interview 15 years ago). 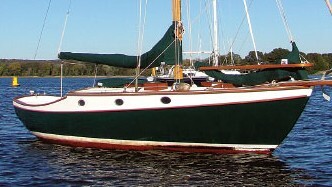 The original Cal 46 was designed as a one-off for an experienced sailor and his family crossing the Atlantic ocean and cruising Europe, including the canals, and the Mediterranean. 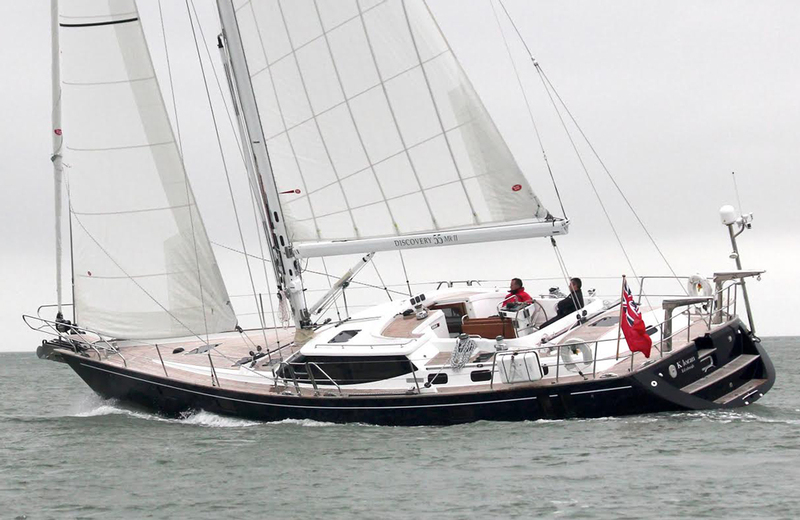 She was designed for both heavy duty open seas cruising as well as coastal cruising - and definitely not as a weekend production boat with all of the compromises inherent in designing for lowest cost and mass production. Lapworth liked the end product enough that he subsequently produced two more of the original design Cal 46’s, one of which he bought for himself, upon retirement. At the time he was the primary designer for Cal-Jensen. Jensen liked the 46 but suggested some changes, which became the Cal 2-46, the queen of the fleet. During the 1970's 120+ Cal 2-46 and a handful of Cal 3-46’s were produced, most of which are still in use today, in a variety of states of repair. Jensen, owner of Cal-Jensen, retired in the late 70’s and sold his company to a Japanese company. Upon retirement he purchased a Cal 2-46 for his own use, with which he circumnavigated the Pacific and cruised up and down the Pacific coast of the America's, from Alaska south, over the next 20 years. 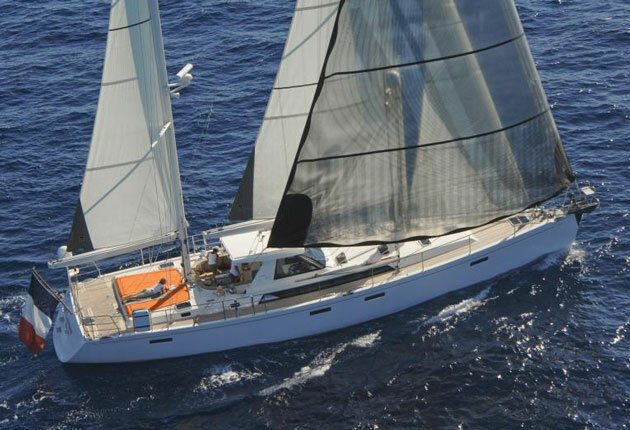 - she is a modified full keel with one piece hull, lead poured in - no keel bolts, no risk of suddenly being upside down if the keel bolts corrode and break. - 46' long but only 12'6" beam. The hull is sleek, and fast. - hull entry is v shaped, not flat, so she is very sea kindly. No slamming in rough seas. - she has a 5' draft, and can navigate shallow waters. 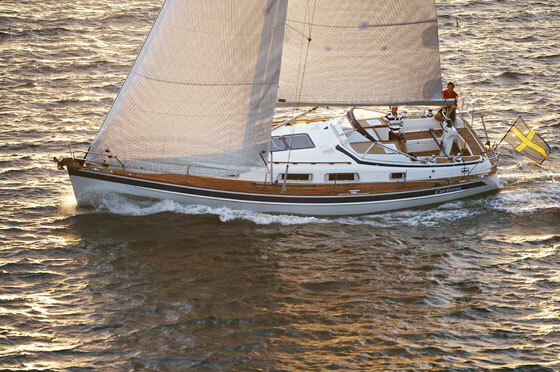 - she has a spade rudder, independent of the keel, with a 4" stainless steel post. Very strong, and very responsive. - a large and simple, non-turbo engine - Perkins 4-236 - with 85 hp. These engines were the power source for airport baggage carts up until approximately 2000 (don't hold me to that exact date) and were the engine of choice on a large number of shrimp fleets worldwide, most of which are still in commercial use. The Perkins 4-236 is considered one of the most reliable and longest endurance diesel marine engines for 40-50 foot boats ever made. Parts are readily available and reasonably priced anywhere in the world. - Lapworth designed her with a 26" three bladed prop, and we added a 26" MaxProp as a backup for use in crossing large oceans. With the standard prop on flat seas she motors at 8 - 8 1/2 knots at 1800 rpm, using 1- 1/14 gallons per hour. On a recent 300 mile trip from Mazatlan to Barra de Navidad we averaged 8 knots for the trip at a constant 1800 rpm, despite having a dirty prop and grass and barnacles at the lower extremities of the keel. My mechanic, Laureano (Lau) Chavez, who crewed with us on the trip, can confirm the mileage and hull condition. - range under power is approximately 2400 miles at 1400-1500 rpm (6 1/2 - 7 1/2 knots), using less than 1 gallon per hour. at that rpm. - that range is possible because she has two fiberglassed into the hull fuel tanks totaling 350 gallons. This was a custom feature created by the original owner - all other 2 and 3-46's had either 125 or 250 gallon capacity, with steel tanks. Hence there is no need for jerry jugs lining the deck for either fuel or water (she has 300 gallon water capacity). Also, the tanks are below waterline, and provide almost 5000 lbs. of ballast in addition to the 8000 lb. lead ballast. We had all 6 ballasted compartments of the fuel and water tanks sand blasted and re-epoxied (2 coats) in March of 2018. - sailing, she's fast (not acceleration fast, but give her 4 or 5 minutes), and she handles like a dream. Despite her weight (35,000+ lbs with all tanks full), she sails at 6+ knots on flat seas on a 10 knot beam reach, and 8 knots at 15-20 knots. 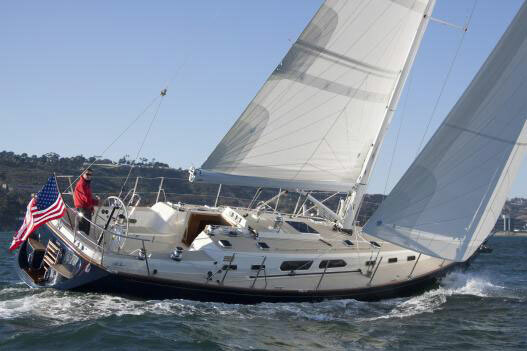 - an example of her performance under sail: coming down from Santa Cruz, CA to Monterey, CA in a trial run back in 2010 we had 15 knots beam reach all of the way. Leaving Santa Cruz harbor we were 300 yards ahead of a Catalina 47. We knew the owner, a Catalina salesman, for whom there was no doubt he intended to pass us. We sailed at approximately 8 knots the whole way and when we furled sail to enter the Monterey harbor the Catalina 47 was still 300 yards behind us. This was despite having 4 1/2 more feet of waterline, 8-10’ taller mast, hence more sail area, and weighting at least 8,000 lbs. less. It was a pleasant surprise to me at the time, but I came to understand - she is a Lapworth boat. - another example of fast (motor and sail). A cruising friend of ours and his wife buddy boated with us on a Sea of Cortez excursion for a couple of weeks, north out of La Paz to Concepcion Bay and back. Their boat was a 46' Ericsson former 46’ IOR race boat that they converted to a cruiser. Prior to our departure we discussed tactics regarding when each of us would leave given anchorages to the next destination and my friend stated that we would probably depart from anchorages along the way at different times due to the speed of our boats. I concurred, conceding that we may have to leave before them, and his response was "no, just the reverse, we will more often have to be leaving before you". The reason being that we were making the trip during the season of what are referred to as 'Northerns', which are 3 to 4 day long 25-40 knot wind fronts from the north west (we were heading northwest from La Paz, so right on the nose), and short, square, 10-12' breaking and confused seas. Not the ideal beam reach sailing conditions that you would expect in southern California, but typical for the Sea of Cortez, and much of the coast of Mexico, Pacific side, during the winter months. His point was that our boat was more able to bash through these conditions than his production racing boat, with its typical of the breed, 45 hp engine and 18" prop. Several days later we were in an anchorage planning an overnight passage north to the next destination. A healthy "Northern" was in play and he decided to leave at 6PM. I plotted the distance and our assumed average speed and decided we could leave at 3AM. I got a call from him on the SSB at 3AM suggesting that we stay put. He had just anchored 9 miles north of us. They had made a very slow 20 miles averaging 1-2 knots, then the winds piped up above 35 knots and they were in danger of broaching, so they had to reluctantly turn back to the first shelter they could find. He said “it’s nasty out here - are you sure you want to leave in these heavy white cap conditions? I said, well yeah, we’ll at least give it a try. We averaged 7 knots at 1800 rpm bashing into 35+ knots and 12’ breaking seas and pulled into the destination anchorage at 3PM the next day not the least bit stressed. They pulled in the next afternoon, definitely more stressed than us. - electric winches for the main and two primaries. There are 3 other manual winches, part of the original design that are still in place as backups. - stainless steel railing from bow to stern to replace the upper wire lifelines. - boom furling for the main (Schaefer) and also a Schaefer furling jib. - a boom brake and two separate preventer systems to help eliminate boom whiplash and potential jibes in turbulent downwind conditions. - the boom brake, preventers, and cradle are helpful also when not sailing. They eliminate boom back and forth “whacking” when motoring ,or motor sailing. 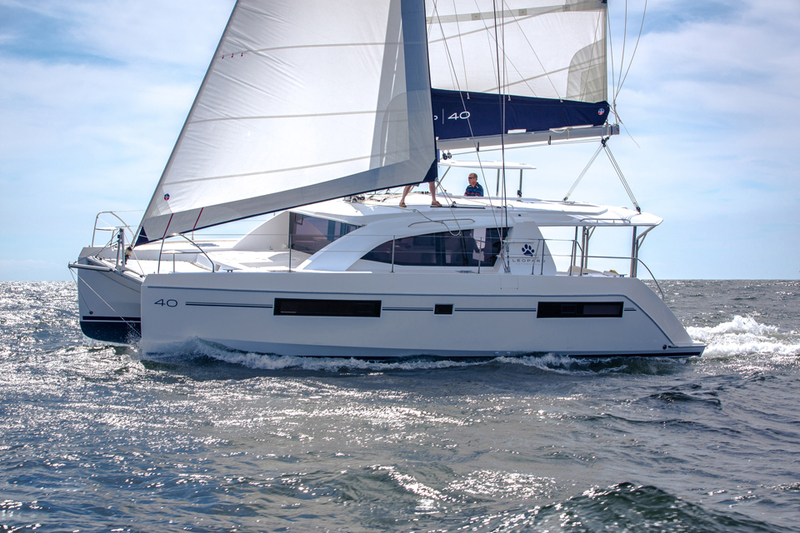 - a custom designed fiberglass hardtop dodger and bimini with Isinglass panels in both the and bimini dodger that extend far enough to shield wind and spray when in the cockpit. Also custom made roll up windows and screens that are hidden under the roof of the bimini and which when in use, fully enclose the cockpit. - for tropical living: a 16,000 btu marine air conditioner for the galley, salon, and v-berth, and 8.000 btu standard window type air conditioner (cover protected) installed over the rear hatch, for cooling the master stateroom. - 1/2” closed cell foam insulation installed in the ceiling and the sides, down to the waterline to provide both noise and cold/heat insulation inside the boat. - a 4KW Generator (1000 hrs.) that supports both start up and extended running of both air conditioners simultaneously. - a new Perkins 4-236 (1200 hours currently), one of the last of their final run, installed in 2005. - PSI dripless shaft seal, just refreshed this year. - a 10’ Avon dinghy with two padded seats with storage, and a 9.9 hp 4 stroke Nissan outboard, also just recently rebuilt. - for northern latitude use: a Webasto diesel fueled hydronic heating system, thermostat controlled, with 5 fan driven heat exchangers in the interior plus a separate heat exchanger for the cockpit. The hydronic system is valved to provide heat from the engine or generator when they are in use, as well as a reservoir tank and pump for when not under power or generator use, to supply hoses under the flooring leading to the heat exchangers. - 4 anchors (2 on bow, a 70 lb. Delta and a Danforth, plus a separate stern anchor, and a reserve anchor stored in the anchor locker. - Raymarine 24” radar, ST60 wind, speed and depth instruments, Chartplotter RL70C 7” and L1250 10” color and high speed displays with fish finder, GPS, and ST6000 autopilot. - Vacu-flush toilets, which use fresh water, l/2 pint per flush, no odors. - a Galley refrigerator powered by a Danfoss Compressor unit, and a larger Danfoss refrig/freezer, both air cooled and evaporator plated.